Probably the simplest recipe I’ve ever made in my life. And the most satisfying too. Four ingredients, minimal fuss, maximum deliciousness. I was mooching around on Pinterest yesterday morning whilst enjoying my lazy bank holiday lay-in when I came across lots of images for peanut-butter related recipes. 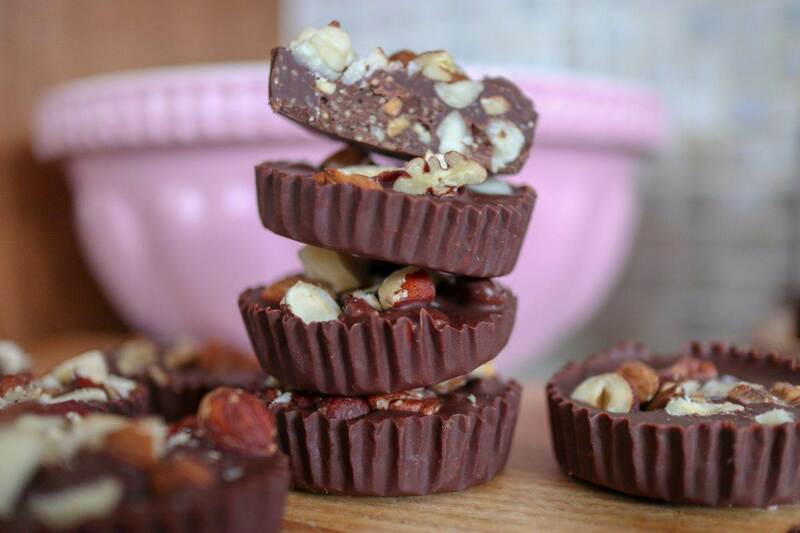 It got me thinking…(and craving) my favourite Reese’s cups and I wondered if I’d be able to recreate my own version. These gluten free and vegan cups are perfect for whipping up at the last minute. Whether you have friends coming over or if you have a major chocolate/peanut combo craving and need to fix it. They’re totally rich, indulgent and ‘definutly‘ only for the real peanut lovers amongst us. Use the best chocolate you can find, the most natural additive free peanut butter, and whilst I used mixed nuts, any would work. Don’t forget the salt too, it balances out the richness of the chocolate and peanuts. 7. Freeze for around 1 hour until firm, peel from the cases and enjoy. The cups will keep really well in the fridge for 3-4 days (if you can resist for that long) and they’re also perfect for freezing and stashing for another day. Bookmark this recipe, pin the image below, ENJOY!